Batman: Arkham Knight - overview of the upcoming expansions (DLCs) / new editions for the last part of the Arkham series. Batman: Arkham Knight, the final part of the Arkham series and is published in several editions. Fans can be certain that a lot of additional content will expand the grim adventures of Bruce Wayne. These contents come along especially in DLCs and in different editions. We'll give you an overview of the announced DLCs and also take closer look at the different editions. The announced content Gotham City point of previously unknown sites and also reveals new insights into the supporting characters. Below you can see what the upcoming DLCs and editions to offer. There is good news for pre-order of Batman: Arkham Knight. You get namely the pre-order DLC insights into the history to Arkham Knight. This you experience through the eyes of Harley Quinn. Furthermore, you expect additional gadgets, Skills and four exclusive Challenge Maps. At this point we have to clean up with a few rumors. Although Publisher Warner announced that it would publish a Batmobile-Edition shortly after the official release, it is now clear that this edition will not appear. With € 199.99 it would have been the most expensive edition, but had a cool Batmobile statue contains that would have been very popular with security. With this edition, there is both more game content and lots of goodies for fans. The additional game content includes the character-skin-pack, which allowed you the Dark Knight with three special skins from the "52 series" clothe. Further reading material gets properly with this version. 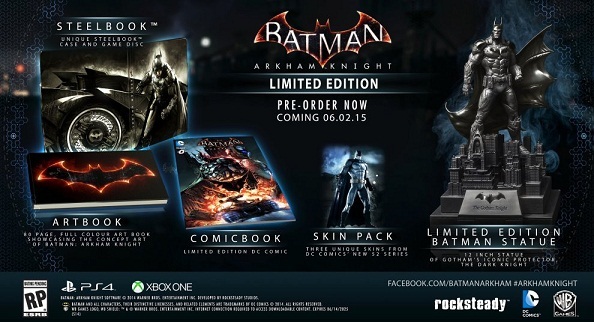 A limited DC Comics, especially the action of Batman: Arkham Knight is as much a part as an 80-page Custom Style Book. Finally, you will receive a 25-cm Batman statue. - Exclusive Batman Skin Pack - Skins from the "52 series"
The Serious Edition is for since the end of May Xbox One and PS4 available. Besides the main game it also contains the Batman 1st Appearance skin, as well as the comic book "Arkham Asylum: Serious House on Serious Earth". The comic has a fancy hardcover design. Currently is not yet clear whether the edition in Germany will be published.